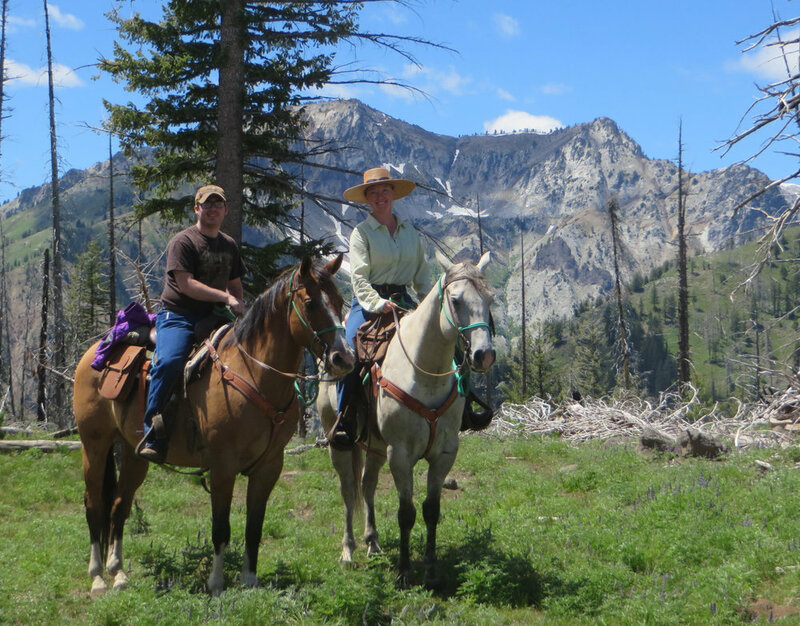 Your horse OR ours… see all the options for exploring the Wallowa’s via a horse-based adventure! “That’s why God made horses”…. Much of the 1,200 square mile Wallowa Mountain range in northeastern Oregon lies within the 360,000 acre Eagle Cap Wilderness, an area with scenic wild rivers like the Minam and Imnaha, 53 high mountain lakes, 540 miles of trails, granite crags, and steep-walled valleys formed by ancient glaciers - and one of the most enjoyable ways to experience all this majesty is from the back of a horse! Check out our Pack Trips, Day Rides and “Bring Your Own Horse” options below.. and then give us a call to book your Adventure today! Whether you've never ridden, or are an Equestrian Olympian, we can take you on a truly memorable trip. While all trips can be customized to your interests and abilities, we do also offer some “pre-planned trips” that make your vacation planning simple! Our Eagle Cap Expeditions are either a 3- or 5-day loop, with 1-2 nights each in 2 separate deluxe camps. For the 5-day trip, on the layover days, you may choose to day ride, fish or just relax and enjoy the stunning views! OR... for small groups or individuals, or for our most popular options, check out our Featured Trips. Click Here for FAQ's and limitations. Whether your a Novice or an Experienced rider, you'll enjoy the amazing views and great horses. We offer several options to meet your interests. For the Novice rider or if you are short on time, consider our Pine Creek Ride. At 1-2 hours, this is a great option to see some beautiful country while getting comfortable on your horse! For intermediate riders, we suggest the Mine History Ride: a 2-3 hour ride up through old town Cornucopia and on up to see the Union Companion Mine and the ruins of the Manager's House, which offers an amazing view over the country immediately to the east and north. For Advanced Riders, we can do any of the above, or extend those rides further for even more great views and history. Or, perhaps you'd like to do an all day (6-8 hour) ride to Pine Lakes and back, or do the East Fork Trail loop. Give us a call to discuss what the best ride may be for you! Rates are $50/hour up to 4 hours. Click Here for FAQ's and age/height/weight limitations. There's nothing more satisfying for a horse owner than to be able to spend hours on your horse's back, exploring the amazing Eagle Cap Wilderness and Wallowa Mountains. However, the logistics of such a trip can be daunting. We strive to make your adventure as stress free as possible. Check out both our “Cabin Stays” and our “Supplied Camp Rentals” below. Cabin Stays: Imagine staying in a clean, comfortable cabin each night and riding up the trail practically from your front door! After spending the day with spectacular views, you can return to a hot shower and great meal in the lodge. Breakfast is included with all stays, and you can even order sack lunches for your ride. For more info on cabins and meal options, click Here. For your equine friend, we have safe and well-maintained 12x12 powder river panel pens. We provide a water source, you provide a bucket and feed. (NOTE: We are an official USFS trailhead. USFS regulations require weed-free feed be fed at all trailheads and on National Forest Lands.) Each pen is $15 for up to 3 nights, $5 for each additional night. Please click Here for FAQ's on pens and riding in the Wallowa's. Supplied Camp Rentals: Want more adventure? Rent one of our Supplied Camps by the night, and ride your own horse in! We provide everything you need except your food & sleeping bag. $100/night for the camp. Call for more info.